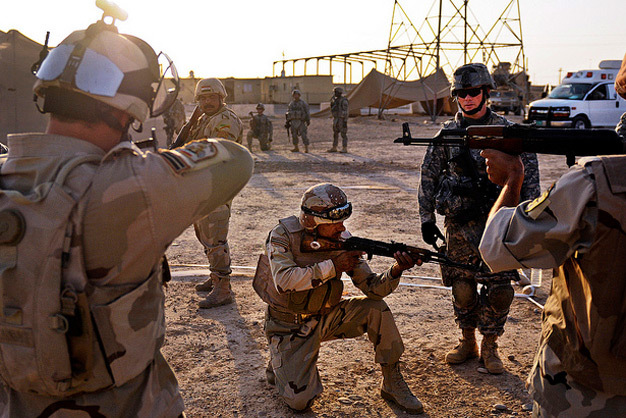 Soldiers from the Company B, 1st Battalion, 5th Cavalry Regiment, 2nd Advise and Assist Brigade, 1st Cavalry Division, train an Iraqi soldier on close-quarters movement during a week of marksmanship training at an Iraqi military post near Contingency Operating Base, Speicher, Iraq, Aug. 18. The Iraqi soldiers learned basic, close-quarters, advanced marksmanship techniques, and how to enter and clear a room in an urban environment. Photo by Spc. Crystal Hudson.